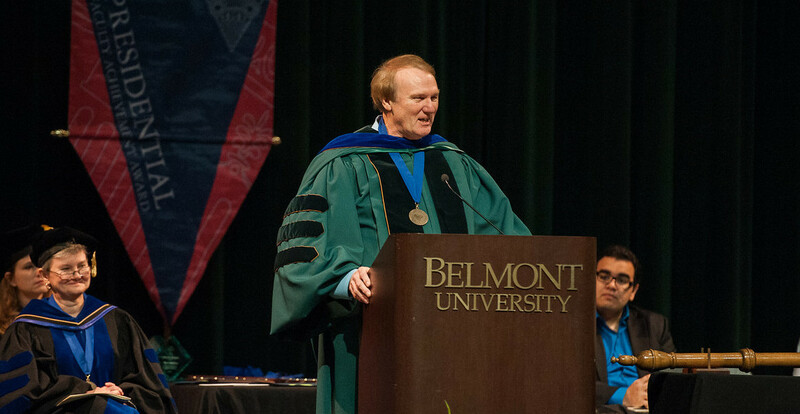 Belmont’s Dr. Ronnie Littlejohn, professor of philosophy and director of the University’s Asian Studies program, was named today as the 2015 Tennessee Professor of the Year, an award selection determined by The Carnegie Foundation for the Advancement of Teaching and the Council for Advancement and Support of Education (CASE). Dr. Littlejohn, who is currently in Washington, D.C. for special ceremonies to receive his award, was selected from more than 300 top professors in the United States. Belmont will be holding its own celebration to honor Dr. Littlejohn on Dec. 1 from 2:30-4:30 p.m. in the Massey Board Room on the fourth floor of the Belmont’s Massey Business Center. The author of six books, Littlejohn received his B.A., master’s and Ph.D. from Baylor University and has conducted post-doctoral work at several institutions including Harvard and Notre Dame. Littlejohn joined the Belmont faculty in 1984 to help begin a philosophy department and served as its chair for 20 years (1993-2013). He also designed the Belmont Honors Program (serving as its first director from 1985-88) as well as the interdisciplinary Asian Studies program, which he continues to oversee. In fact, Littlejohn was Tennessee’s co-director of the National Consortium for Teaching about Asia (NCTA) from 2007-2011. He has also taught Asian philosophical and religious beliefs for Air Force officers of the Pacific Command (PACOM) Theater of Special Operations Forces (2011), and he has led workshops to enhance the teaching of Asia at more than a dozen universities. Littlejohn’s current work is in Comparative Philosophy, especially classical Confucianism and Daoism. He has many teaching awards to his credit, including the Award for Innovative Excellence in Teaching presented by the International Conference on Teaching and Learning (2003). Belmont University professors represent six of the past 16 Tennessee Professors of the Year: 2000 winner the late Dr. Mike Awalt (Philosophy), 2001 winner Dr. David Julseth (Spanish), 2007 winner Dr. Pete Giordano (Psychology), 2008 winner Dr. John Gonas (Finance), 2012 winner Dr. Mike Pinter (Math) and Dr. Littlejohn this year. This year, a state Professor of the Year was recognized in 35 states. CASE assembled two preliminary panels of judges comprised of deans and professors, education reporters and government and foundation representatives to select finalists. The Carnegie Foundation for the Advancement of Teaching then convened the third and final panel to select the winners. Dr. Littlejohn was selected from faculty members nominated by colleges and universities throughout the country. The Carnegie Foundation for the Advancement of Teaching is an independent policy and research center that supports needed transformations in American education through tighter connections between teaching practice, evidence of student learning, the communication and use of this evidence and structured opportunities to build knowledge. Founded in 1974 with headquarters in Washington, D.C., with offices in London, Singapore and Mexico City, the Council for Advancement and Support of is a professional association serving educational institutions and the advancement professionals who work on their behalf in alumni relations, communications, development, marketing and allied areas.